Some 23,000 chickens are to be destroyed at a poultry farm with a bird flu outbreak. The H5N8 avian influenza virus was found at Bridge Farm in Redgrave on the Suffolk/Norfolk border. A 6.2-mile (10km) control zone has been set up around the Banham Poultry-managed site. 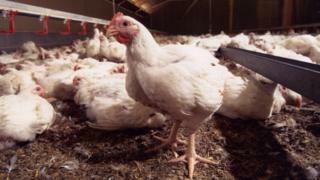 Richard Griffiths, chief executive of British Poultry Council, said it was a "concerning" time for the industry. He said: "It is the most extensive series of outbreaks we've had for many years. "There is concern but there's also determination to work with Department for Environment, Food and Rural Affairs to stamp out bird flu." All bird movements in the area of Bridge Farm have been halted. Four chicken sheds at the site will be emptied, decontaminated and will have to stand empty for at least 30 days. Banham Poultry, based at Attleborough in Norfolk, said: "Birds at our other farms appear healthy and there is no evidence of any spread of infection." It said the farm was used for breeding and did not produce meat. A spokesman said: "The birds will now be humanely culled by the authorities in accordance with EU legislation. "All of our staff are trained in biosecurity management and we are ensuring that the controls that are in place are rigorously followed. "We will continue to cooperate with the authorities to ensure that the situation remains under control." The Food Standards Agency said bird flu was not a food safety risk to consumers.